The emergence and refinement of techniques in molecular biology has changed our perceptions of medicine, agriculture and environmental management. Scientific breakthroughs in gene expression, protein engineering and cell fusion are being translated by a strengthening biotechnology industry into revolutionary new products and services. Many a student has been enticed by the promise of biotechnology and the excitement of being near the cutting edge of scientific advancement. However, graduates trained in molecular biology and cell manipulation soon realise that these techniques are only part of the picture. Reaping the full benefits of biotechnology requires manufacturing capability involving the large-scale processing of biological material. Increasingly, biotechnologists are being employed by companies to work in co-operation with chemical engineers to achieve pragmatic commercial goals. For many years aspects of biochemistry and molecular genetics have been included in chemical engineering curricula, yet there has been little attempt until recently to teach aspects of engineering applicable to process design to biotechnologists. 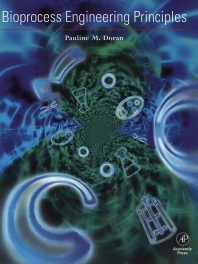 This textbook is the first to present the principles of bioprocess engineering in a way that is accessible to biological scientists. Other texts on bioprocess engineering currently available assume that the reader already has engineering training. On the other hand, chemical engineering textbooks do not consider examples from bioprocessing, and are written almost exclusively with the petroleum and chemical industries in mind. This publication explains process analysis from an engineering point of view, but refers exclusively to the treatment of biological systems. Over 170 problems and worked examples encompass a wide range of applications, including recombinant cells, plant and animal cell cultures, immobilised catalysts as well as traditional fermentation systems. Suitable for course adoption - follows closely curricula used on most bioprocessing and process biotechnology courses at senior undergraduate and graduate levels. INTRODUCTION: Bioprocess Development: An Interdisciplinary Challenge. Introduction to Engineering Calculations. Presentation and Analysis of Data. MATERIAL and ENERGY BALANCES: Material Balances. Energy Balances. Unsteady-State Material and Energy Balances. PHYSICAL PROCESSES: Fluid Flow and Mixing. Heat Transfer. Mass Transfer. Unit Operations. REACTIONS and REACTORS: Homogenous Reactions. Heterogeneous Reactions. Reaction Engineering. APPENDICES: Conversion Factors. Physical and Chemical Property Data. Steam Tables. Mathematical Rules. Chapter Summaries, Problems, References, And Suggestions for Further Reading. List of Symbols. Index.